I’ve never before been interested in Graphic Novels (although I do love Archie Comics), but I was quite intrigued when I discovered that June’s book club book is in fact, a graphic novel. 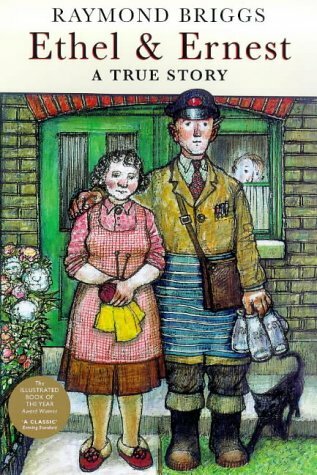 And then I realized that I actually already own another graphic novel by Raymond Briggs - Gentlemen Jim - which I picked up over a year ago at a second hand bookshop, because the title and the premise made me think of my husband, Jim. I will have to do a proper read of that one since I enjoyed Ethel & Ernest so much. I’m not used to reading a story where so much happens but takes only about 30 minutes to read. I actually read Ethel & Ernest at a coffee shop while sitting next to my good friend Lindsay last week. It was fun to “awww” and “ooooh” at the same times. And while some of the British-isms were lost on us, I don’t feel it made the story any less enjoyable. Ethel & Ernest is a charming, honest account of the life of Raymond Briggs’ parents. It starts with how they meet in the 1920s and follows the ups and downs of their lives as they learn how to thrive (and survive) together during times of war, financial crises, raising a child and growing old. It’s sad at times, with a good dose of humour, but mostly, I found it quite full of love. To be talented enough to pay homage to your parents in such an art form – with not only words, but illustrations to boot – is beyond amazing to me. If you ever come across this little gem, don’t hesitate to pick it up. It’s worth the quick read, I promise.